For decades, teachers have proclaimed that arts education is important. However, with the increasing focus on STEM education, the arts are not always recognized as a vital component of 21st century learning. Although the emphasis on STEM is essential to meet the needs of our ever changing economy, at Art in Action we believe that putting the “A” into STEAM best prepares children with the skill set they will need to become successful, well-rounded thinkers. Here are 5 critical skills students learn through an arts education. Creativity: In a word full of trained professionals and highly educated workers, creativity is one of the top skills that set someone apart from the pack. Of course, being qualified in your field is important, but having the ability to think imaginatively and bring fresh ideas to the table are essential to innovation and progress. Art education allows students to express themselves and think outside of the box. Collaboration: Working together for a common purpose teaches children that their contribution is important, which is perfect for the collaborative nature of the arts. By working collaboratively on a project, students learn to communicate more effectively, compromise when necessary, and work hard even if their role may seem small. All of these skills are vital in any work environment where teams come together for a common goal. Confidence: The arts create a safe space for students to explore their talents and build their confidence. Students who are shy in a normal classroom setting may gain the assurance to stand up and talk about their artwork. The sense of pride gained through a finished product encourages the students to keep trying and striving to accomplish more. With this confidence, they are more likely to take risks and step out of their comfort zone to try new things in other areas of their lives. Cultural Awareness & Empathy: The arts provide a unique platform to discuss many different cultures, socioeconomic levels, and current events. Through the arts, students have a place not only to learn about different cultures than their own, but also to ask questions and be more informed about the daily struggles and realities of people who may seem different. By learning about other people, children are able to develop their ability for empathy, essential in working with people from all walks of life, and realize that we have more in common than not. Critical Thinking: When students are making a work of art, the process includes conceptual and interpretational thinking that helps build their critical thinking skills including observation, reasoning, and problem-solving. During the creative process, children use logic and problem solving to strategize how to reach their intended outcome. Critical thinking skills are also in play when observing and analyzing famous works. This ability to think critically to solve problems in a unique way is key to the 21st century workplace. 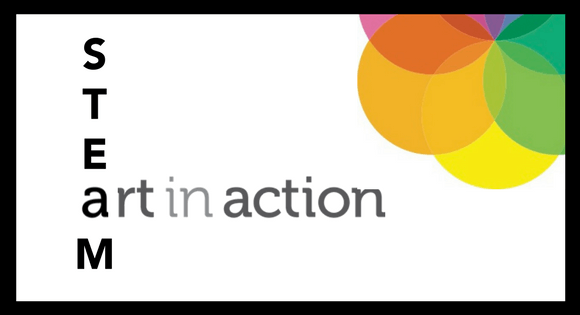 For Art in Action students, the benefits of receiving an arts education are far-reaching, and essential preparation for success in the 21st Century. Through the lessons they explore, students are able to hone their critical thinking and creativity while learning how to better work with others for a common goal. Looking to explore how how the “A” fits into STEAM? Try out this free mini science lesson combining art with marine biology!